In an athletic context, such male garments are designed to allow freedom of movement while providing fabric at the chest and underarms to soak up sweat; otherwise, they’re fashion statements, designed to show off the mid-section of their wearer as vulnerable or powerful (or, often, both). But what are these garments called? The sleeveless scrimmage tee in the … photo is (apparently) sometimes called a cropped scrimmage tee, which is clear though wordy. Unfortunately, cropped t-shirt is also used, reasonably enough, for bottomless scrimmage t-shirts. And scrimmage t-shirts are mostly (but not only) for men, though half t-shirts and midriff t-shirts (or midriff tops) seem to be very predominantly for women (or little girls). Sleevelessness was the focus of that posting, but here we’re into bottom-cropping, which I touched on only briefly in that posting. adj.crop in OED3 (June 2005) = adj. cropped. Etymology: Either < crop v.or shortened < cropped adj. [by t/d-deletion]. Esp. 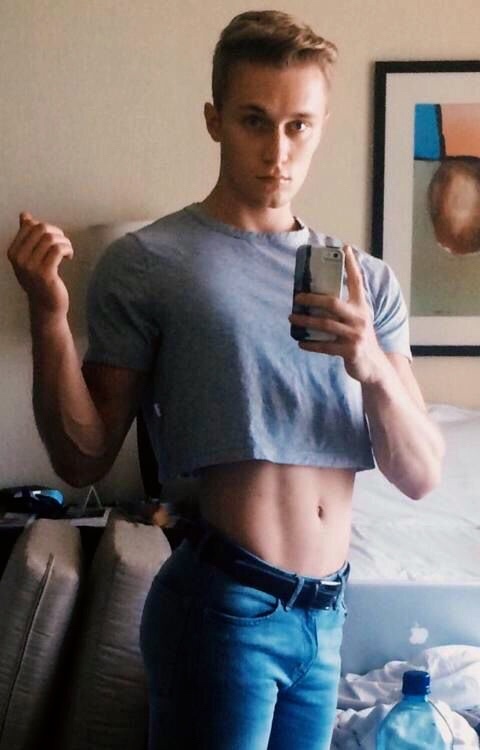 in crop top. 1957 Newark (Ohio) Advocate & Amer. Tribune 28 Feb. 32/1 (advt.) Look for softer box jackets..and short crop jackets. 1971 News Jrnl. (Mansfield, Ohio) 29 Apr. 33/1 (caption) Crocheted crop-top is a great look for today. 1982 Washington Post 20 May c5/1 Baggy sweat pants and shapeless tops have turned into minis, crop pants,..harem pants and shorts. 1990 California Apr. 74 A sequined crop top makes a sparkling swimsuit cover-up. 1995 Kay’s Catal. Autumn–Winter 4/1 Latest mohair mix crop sweater with front cable design. 2001 B. Hatch Internat. Gooseberry 226 She had..a tattoo on her belly, which you could see under her crop-top. Of a garment: cut shorter than is usual. Cf. crop adj. 1954 News Jrnl. (Mansfield, Ohio) 23 Feb. 20/1 Party coats are being shown in full-length styles and in tiny, cropped jackets. 1970 Vogue Jan. 37/1 Pillar box cotton jersey for the jeans..and cropped T-shirt. 1982 N.Y. Times (Nexis) 21 Dec. b16 We are continuing the..short cropped tops, which we’re making even shorter. 1999 Daily Tel. 23 Sept. 5/2 Belts made from shells were slung around the hips of..cropped pants. … The early history of the crop top intersects with cultural attitudes towards the [bare] midriff, starting with the performance of [“belly dancer”] “Little Egypt” at the 1893 Chicago World’s Fair. Although the crop top started gaining prominence in the fashion industry during the 1930s and 1940s — the latter in particular due to fabric rationing in World War II — it was largely confined to beachwear at the time. It was not until the sexual revolution of the late 1960s and early 1970s that it started to achieve widespread acceptance, promoted by celebrities such as Barbara Eden and Jane Birkin. A variant style, the tied top or knotted shirt, also started appearing in 1940s fashion and spread in popularity during the 1960s. on top of having 3 of my shirts cropped to the shitter I decided to get 3 others cropped to my [waist] line to give a “shirt is too short” effect and I was actually really happy with how they turned out and can’t wait to wear them over the coming months before winter. I also find it really funny that Crop Tops for men were a thing years ago. 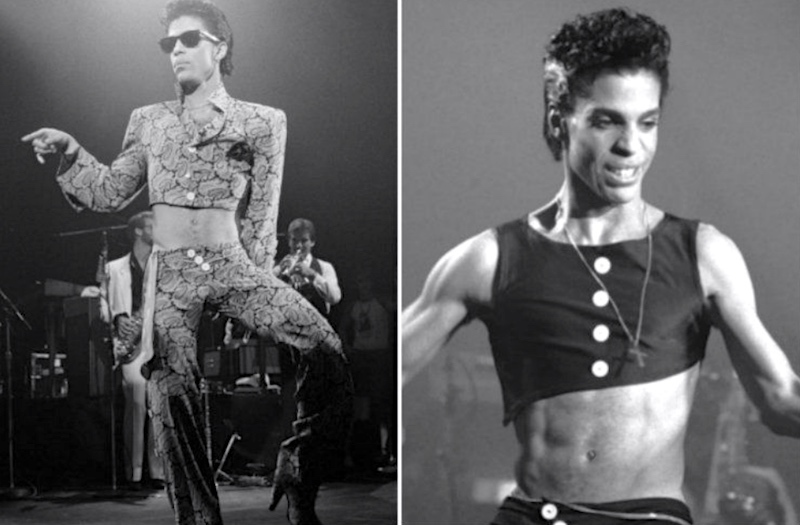 [AZ: cut him some slack; he’s young] … obviously after seeing crop tops on men everywhere I did some research and it’s turns out superstars like Prince were wearing crop tops way back!!! This entry was posted on August 2, 2018 at 3:32 pm and is filed under Clothing, Fashion, Gender and sexuality, Movies and tv, Names, Shirtlessness. You can follow any responses to this entry through the RSS 2.0 feed. You can leave a response, or trackback from your own site.